In May 1969, an American artillery platoon near Phu Bai suffered heavy losses during a night attack by North Vietnamese infantry. Since the platoon originated from a Kentucky National Guard unit, many of the dead hailed from the same county, which threw a community into deep mourning. 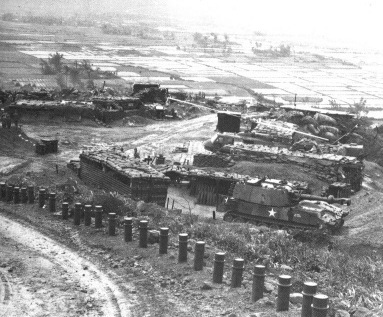 The firebase near Phu Bai, overrun in May 1969 (Courtesy Kentucky National Guard). Paulette Livers, a native Kentuckian, has turned this collective grief into a novel, Cementville, named for the fictional county seat that lays to rest seven of its sons. Livers casts her net widely, trying to re-create an entire town, many of whose members are related by blood or marriage, and how they grieve the losses (or don’t). Each has an intersecting story, which gives the novel a mosaic feel. There’s thirteen-year-old Maureen, determined to live an important life, while her mother, Katherine, does her best to keep the apron strings tied, the relationship that interested me the most. But Cementville also has a Vietnamese war bride; a murderous clan, the Fergusons, who live in trailers; Nimrod Grebe, an elderly black man who fought in World War I; a woman who invents reasons not to leave her house, except to visit the library; and many others. What an ambitious scheme. I applaud the attempt to depict a world split in pieces by love, hate, heroism, patriotism, bitterness, and grief. That’s like reaching for the stars, and not enough novelists do that today. Also, as someone who remembers 1969 very well, I’m always looking for a full-fledged, honest rendition of that time. The jacket flap promises a “microcosm of a society shedding the old order and learning how to live with grief,” so I grabbed Cementville off the library shelf. Further, Livers writes well, beautifully, at times. But Cementville, though a valiant attempt, remains mostly earthbound for me. For one thing, it’s more a collection of stories than a novel, unlinked by any common thread, except a murder that seems gratuitous, even trivial, next to everything else. Significant characters behave strangely, for no apparent reason, and some of the better-drawn figures, like Katherine and Maureen, need deeper inner lives. Then too, the town isn’t a microcosm of anything; it’s a pastiche. The narrative mentions that Katherine’s reading The Feminine Mystique, and also refers to possible resentment in the town that a young girl from the Ferguson trailer clan keeps house for Nimrod Grebe, the elderly African-American. But that’s the extent of feminism and race relations here. I can’t blame Livers for not living up to the hype–authors don’t necessarily write their own flap copy–but I wish she’d provided a true sense of time and place. It takes more than passing references to Led Zeppelin or fish-net stockings to portray an era that feels lived in. Nobody in this novel debates or feels strongly about signs of change, whether campus protests, the moon landing, hallucinogenic drugs, hemlines, haircuts, or any other aspect of that noisy era. Even more astonishingly, nobody discusses the war that has caused such pain, nor do the young men who lost their lives appear as anything but faceless ghosts. This is a crucial weakness, I think, reflected in how there seems to be only one resident supporter of the war among many critics of it. That rings false, both to the fictional world and what actually happened. In fact, Livers could have used differing opinions about the war, and whether the local boys died in vain, as a driving (and dividing) force. Consequently, it’s not just outside events that fail to echo in Cementville; it’s the disaster in Cementville that fails to shake the place deeply enough. Dislcaimer: I borrowed my reading copy of this book from the public library.